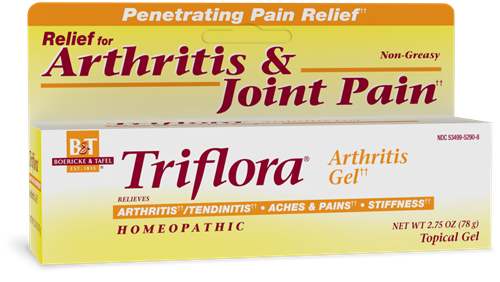 Triflora Arthritis Gel / 2.75 oz - Nature's Way®. Triflora® Arthritis Gel†† temporarily relieves minor aches, pain and joint/muscle stiffness associated with arthritis, tendinitis, rheumatism and simple backache.†† It contains three active ingredients that help to temporarily relieve joint/tendon pain and inflammation.†† It has no petroleum and will not leave a greasy residue on clothing or the skin and has just a mild herbal scent. Do no use if hypersensitive to this or any other ingredients in this product; this product contains poison ivy (Rhus tox) plant materials.